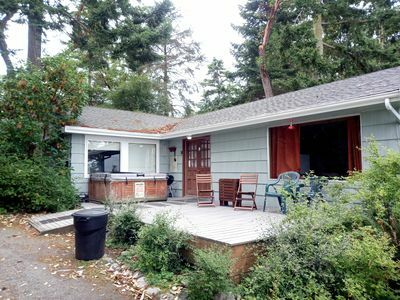 Bakerview Beach House-BEAUTIFUL OCEAN FRONT LIVING! Pet Friendly! 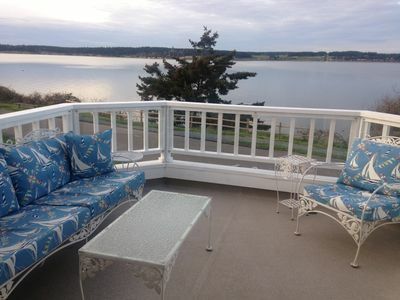 Bakerview Beach House LLC-Beautiful Oceanfront Living!! Between June and October there is a week minimum stay. Check out the video I took right in front of the house! From March to July is when the Gray Whale return on their annual migration. They stop by right infront of Bakerview Beach House to feed on the Ghost Shrimp before heading North. 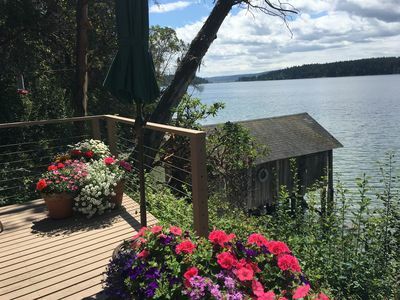 Whether you are looking for the perfect family vacation, romantic getaway, retreat with friends, or a quiet place to write, create or just breath, this is the place for you! Even in the winter you can relax in quiet comfort in front of the fire enjoying the beautiful view of Mt. Baker while listening to the waves crashing on the shore. 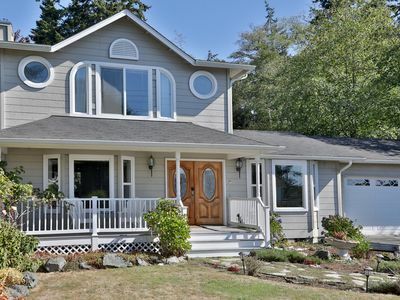 Conveniently located in the center of beautiful Whidbey Island in Washington's sunbelt region. 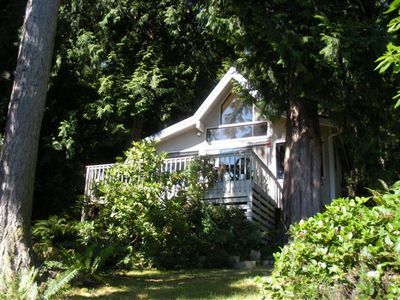 Bakerview Beach House LLC is on the OCEAN, only 2 hours from Seattle and 2.5 from Canada. 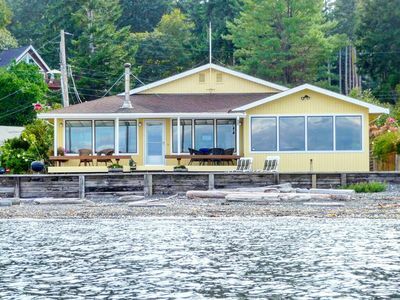 This newly renovated beach house has a fully equipped updated kitchen with new granite counter tops, ceramic cook top stove, dishwasher, refrigerator with an ice maker and a large breakfast bar open to the living and dining area. The dining table can be enlarged to accommodate 8-10 people. 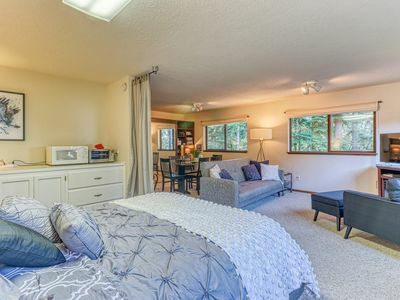 The living area has comfortable seating, a television and NEW pellet stove to enjoy during those cozy evenings. 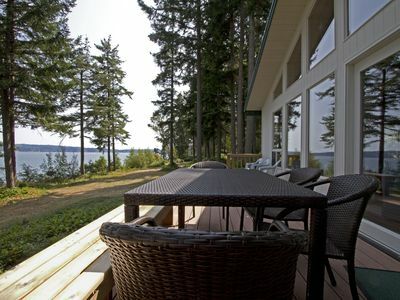 These rooms have a beautiful unobstructed 180* view of Saratoga Passage, Camano Island and Mt. Baker. There are three large bedrooms two with queen size beds, one with a television, one bedroom has twin beds that can be converted to a king. All have luxury bedding with hypoallergenic down alternative comforters. 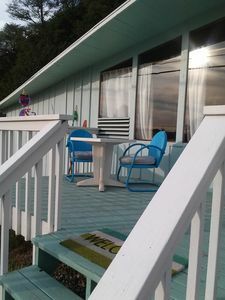 Two bathrooms one with a steam shower and laundry room with a full size washer and dryer. 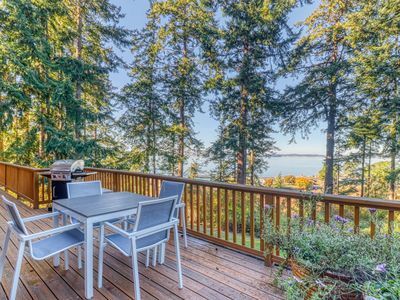 The LARGE covered deck is perfect for relaxing, enjoying the spectacular view of Mt. Baker and listening to the waves lapping on the beach while watching sailboats and kayaker's cruise by. There is an abundance of wildlife to enjoy from eagles, heron, loons, guillemots, otter, seals, and at times whales. 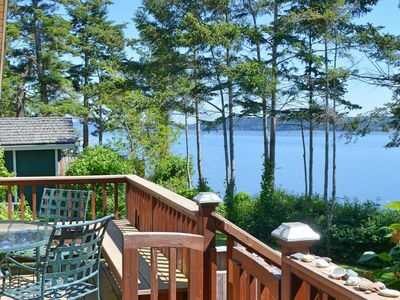 There are gently sloping stairs that get you to your private beach. The beach is abundant with clams, mussels and occasionally oysters, you can even catch salmon right from the beach. Strolling the beach you will find agates, shells, driftwood and many other treasures. 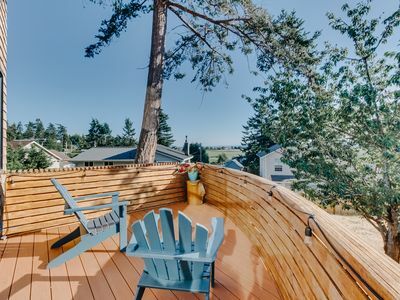 If you can tear yourself away from the deck this centrally located home is minutes from everything. 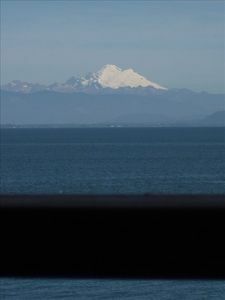 The incredible vistas at Deception Pass, miles of walking and cycling trails at Fort Ebey State Park. Kite flying, beach combing and exploring at Fort Casey State Park and Admiralty Lighthouse. 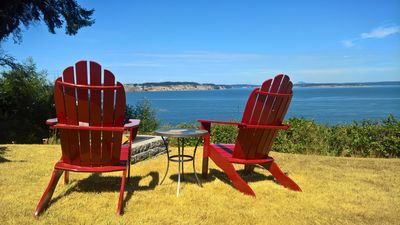 Take a short ferry ride to Historical Port Townsend on the Olympic Peninsula or spend the day wandering quaint Coupeville, where they grow the famous Penn Cove mussels, kayak rentals, the museum, or Whale Watching tours and Farmer's Market in the summer. 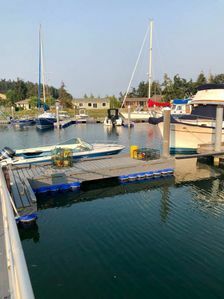 Coupeville also offers a grocery store, shops and the best ice cream on the Island. Langley has a historical movie theater that show the latest movies and a live theater group as well as numerous shops featuring local artists. There are a number of wineries that offer tours and tastings. There are several golf courses in the area as well as on the peninsula. Whidbey Island is home to NAS Whidbey Air Station. You may get the chance to see navy pilots practicing aircraft carrier landings at the outlaying field in Coupeville. At times they pass very close to the house and are very loud. Ask about Art & Adventure with Patte. Pottery, Fiber Art, Beach Exploration and more! 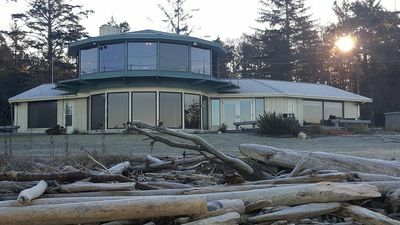 Luxury Beachfront on Whidbey's Westside - Sand and Sunsets! NEW LISTING! 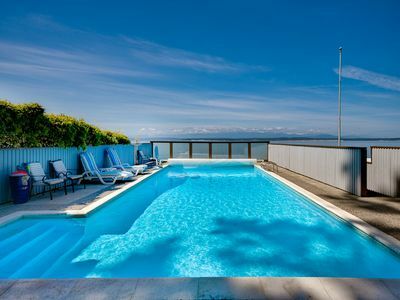 Sophisticated suite w/ a kitchenette & easy beach access! NEW LISTING! 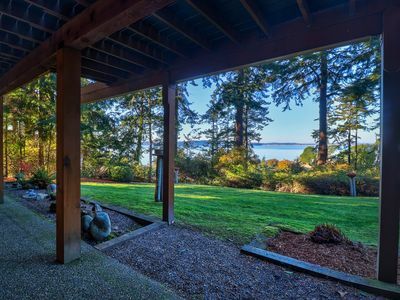 Northwest-style cabin with stunning views of the ocean! NEW LISTING! 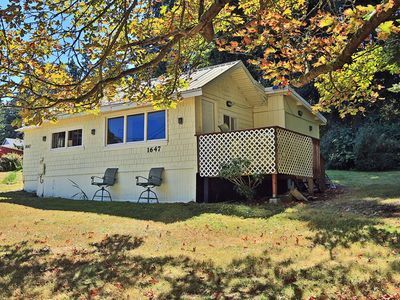 Charming retreat with everything you need and gorgeous ocean views!